1) Make sure your hedge trimmer is lightweight enough for you to hold it for expended periods of time? Dropping is not a risk you want to take, nor is damaging your back. 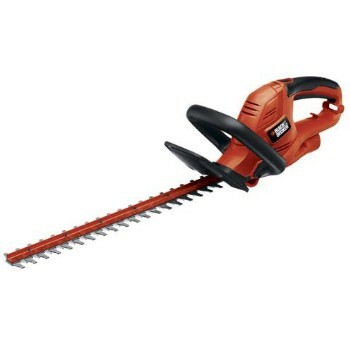 You want to be able to safely operate and support the hedge trimmer you choose. It will not be good for anyone if no one in your family can operate it. 2) Make sure your fingers, or anyone else that will be operating this piece of machinery, cannot fit between the cutting teeth and the guards. 3) Make sure that the blades are sharpened properly and well before each use. Sharper blades make cleaner cuts, which leaves a smaller opportunity for catches and tears and other things that can go wrong. 4) Read the manual for extra precautions you may need to take with your particular tool. This is self-explanatory and yet most people never bother reading the manual. This is an important step that could save someone’s life or in the very least, someone’s limb. 5) Wear adequate protection for your eyes and ears. 6) Never trim above your head. This is another tip that should never need to be explained and yet people are injured doing exactly this all the time. If you need to trim high, get a ladder and climb to the height you need to be in order to operate your machinery properly.